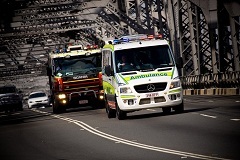 A US$6 million rollout of new traffic signal technology is to be rolled out across Queensland, Australia, over the next four years to improve travel times for emergency services vehicles, allowing quicker response times to priority incidents across the state. Emergency vehicle priority (EVP) technology automatically interrupts traffic signal operations to provide a green light signal to emergency response vehicles when safe to do so. A recent performance evaluation of EVP in the Gold Coast area has shown that travel time for EVP equipped vehicles was reduced by 17-26% compared to non-EVP equipped vehicles.